My wonderful French teacher Caroline is moving to Florida and I am désolé. Among other things, she has shared in my interest in food, especially but not entirely French cuisine, and requested that I make her a clafoutis aux cerises before her departure. Resistance being futile, I complied. In France, June is the month when spectacular cherries are abundant, and virtually every restaurant serves clafoutis to take advantage of them. 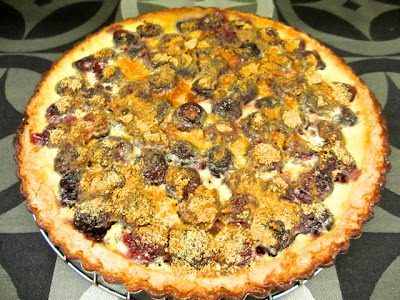 A clafoutis essentially consists of fruit over which a pancake-like batter is poured, which is then baked. It is sometimes made as a tart and sometimes just baked in a heatproof dish. I opted for the tart, because I love making tarts, and found a recipe from the legendary Joel Robuchon, in Simply French, the master's collaboration with Patricia Wells. One of Robuchon's twists is to powder the tart with ground-up baked morsels of the tart dough, which you can see in the photo above. I was pleased with the result, and so was Caroline and some of her colleagues who came by to partake of the tart. However, I plan to go with a simpler, more classic and less intimidating version next time. I am off to Paris next week, where the cherries are better than the ones we get from the West coast this time of year, and where I will no doubt sample a few versions of the real thing. I've made many (rectangular and square) clafoutis but yours really look good. Have a wonderful time in Paris. (I just finished reading "Paris" by Edward Rutherfurd. It was wonderful). Rutherford's book got good reviews; thanks for yours. I will definitely read it.